Japanese scientists say they have found a way to slow down the ageing process in flowers by up to a half, meaning bouquets could remain fresh for much longer. 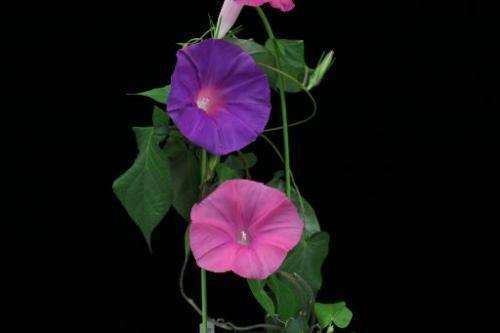 Researchers at the National Agriculture and Food Research Organisation in Tsukuba, east of Tokyo, said they had found the gene believed to be responsible for the short shelf-life of flowers in one Japanese variety of morning glory. "Morning glory" is the popular name for a hundreds of species of flowering plants whose short-lived blooms usually unfold early in the day and are gone by nightfall. By suppressing the gene—named "EPHEMERAL1"—the lifespan of each flower was almost doubled, said Kenichi Shibuya, one of the lead researchers in a study carried out jointly with Kagoshima University in southern Japan. "Unmodified flowers started withering 13 hours after they opened, but flowers that had been genetically modified stayed open for 24 hours," he said. This means the plant has fresh purple flowers alongside the paler blooms from the previous day, he said. "We have concluded that the gene is linked to petal ageing," Shibuya told AFP by telephone on Thursday. The finding could lead to developing methods to extend the life of cut flowers, he added. "It would be unrealistic to modify genes of all kinds of flowers but we can look for other ways to suppress the (target) gene... such as making cut flowers absorb a solution that prevents the gene from becoming active," Shibuya said. For some flowers, such as carnations, florists currently use chemicals to inhibit ethylene, a plant hormone which sometimes causes blooms to ripen. But ethylene is not involved in the ageing of some popular flowers, such as lilies, tulips and irises. A gene similar to EPHEMERAL1 could be responsible for petal ageing in these plants, Shibuya said, meaning the ability to suppress it would extend their life. What genes help blossoms last longer? If you like longer lasting blossoms, then you'll likely very much appreciate the work being done for longer lasting humans at the SENS Research Foundation (strategies for engineered negligible senescence).